________________________________________________ DiskStation DS415 . Running on Synology DiskStation Manager (DSM). Utilities Synology Assistant, Cloud Station, Evidence Integrity Authenticator. Relative Humidity 5% to 95% RH. CPU 2.0GHz, 512MB RAM, Hard Drives not included. This NAS is a working pull from the floor (We are moving to Cloud based Storage). Still works very well. With two storage bays, the DiskStation DS216se from Synology is capable of housing two 8TB 3.5"/2.5" SATA II/III hard drives for a total storage capacity of up to 16TB. Inside the DS216se you will find a floating point Marvell Armada 370 800 MHz CPU and 256MB of DDR3 RAM to ensure smooth operation. This is a Synology 411slim NAS unit. I am the only owner, and it is in full working condition. I've attached a screen shot showing the storage manager and operations. You can swap in larger drives of course. Mfr Part #: DS218J. DiskStation DS218j SAN/NAS Storage System. Access files on your Synology NAS over the Internet without the hassle of setting up port forwarding rules, DDNS, or other complicated network settings. This Synology DS115 is in good condition. It has a 1TB WD hard drive installed. Power adapter and ethernet cable are also included. Mfr Part Number: RS1219 . Power frequency: 50/60Hz, single phase. Manufacturers change colors and item details frequently and often do not update pictures. We have no personal knowledge or experience with this product or ability to customize it. For DS1815 , DS1813 , DS2015xs. RS815 , DS1513 , DS1515 . We will try our best to resolve the issue. 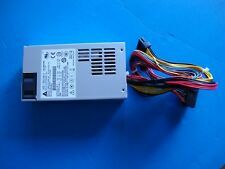 This is a working NAS that was no longer needed, it is in good working condition with no known issues. You are buying a Used Synology Diskstation DS215j 2 Bay NAS server. Synology specs PDF for this model No Drives are included. Synology DS216 II DiskStation 2-bay NAS. Excellent working condition. Trending at $216.00eBay determines this price through a machine learned model of the product's sale prices within the last 90 days. Synology DiskStation DS119j is a budget-friendly, versatile and easy-to-use 1-bay NAS with the capability to host, share and protect data for personal users. Synology DS119j is backed by Synology's 2-year limited warranty. Includes: NAS and power adapter. 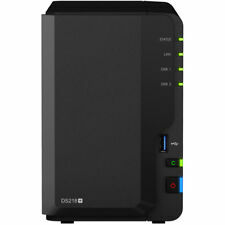 1 x Synology DiskStation DS115 Single Bay NAS Server. 1 x WD Red 2TB Hard Drive. 3.5" SATA III / SATA II HDD. 5.44 W (HDD Hibernation). Compatible Drive Types. Relative Humidity. Max User Accounts. 50/60 Hz, Single Phase. (This is a bare unit. No hard drives are included.). This beauty works 100% and is ready to rock for you! If you are looking for an affordable NAS, this is it! For sale is a used, but cared for and excellent condition; Synology DS216j NAS. 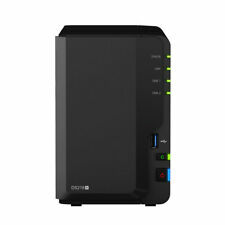 - Synology DS216j NAS. - Original Box or Manual. Not Included. 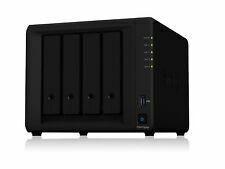 Synology NAS DS210j DiskStation 2-Bay. Excellent condition. When the storage capacity on Synology 1U RackStation reaches its limit, Synology expansion unit RX418 provides easy capacity expansion by adding 4 3.5"/2.5" SATA drives to the system. Simply connect Synology RX418 to corresponding Synology RackStation and it is ready to use. Mfr Part #: RKS1317. 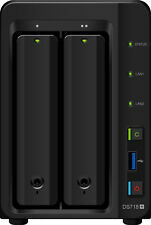 Compatibility: Synology RS Series Network Storage Systems. Device Supported: Network Storage System. Windows Offloaded Data Transfer (ODX) speeds up data transfer and migration rate. OpenStack Cinder support turns your Synology NAS into a block-based storage component. Maximum Internal Raw Capacity:48 TB (12 TB drive x 4) (Capacity may vary by RAID types). Item ID: S24851. 4K 10-bit H.265 video transcoding on the fly. Dual 1GbE ports with failover and Link Aggregation support. Synology DiskStation DS1517. P/N: DS1517. Model: DiskStation. 5 Bay Chassis Only (No Hard Drives). Condition: Good Condition. Tested GOOD. Item Details. Synology DS416 Disk Station 4-Bay Network Attached Storage (NAS) w/Four 500GB HD. Condition is Used. Shipped with USPS Priority Mail. Item is still under warranty until July with Synology. The drives are included for free and are really intended to just get you started as they are used drives and may have errors but they are showing as healthy in storage manager. As a bonus, I will include a lot of video content more than the size of the one of the drives that will be popular movies and TV shows. You will be happy with this content. Disk station will be removed from my Synology account and is in perfect working order. Will ship this item in bubble wrap within 24 hours of receipt of payment. The shipping will be priority mail for speedy delivery. The item is New in Open Box. What is included: Synology DS418 Diskstation 4-Bay Diskless NAS Network Attached Storage (S/N:17C0PHN680200), Power Adapter and Cord, Two Cables, Two Keys, Screwdrivers & Manual. Synology DS411 Slim NAS. DiskStation DS411 Slim. ● Cool and Quiet. ● Small Footprint. Synology Diskstation DS2413 . includes hard drive trays and screws, no hard drives. Internal HDD/SSD: 3.5” or 2.5” SATA(II) X 2 (hard drives not included). External Device Ports: 1 X USB 2.0 port, 2 X USB 3.0 ports, 1 X eSATA port. Hot Swappable Drive: Yes. Max Internal Capacity: 12TB (2 X 6TB hard drives). Synology NAS. 8 Terabyte NAS. Network Attached Storage Device. Mfr Part #: DS218PLAY. DiskStation DS218play SAN/NAS Storage System. Access files on your Synology NAS over the Internet without the hassle of setting up port forwarding rules, DDNS, or other complicated network settings. With built-in dual 10GbE LAN ports in addition to dual Gigabit ports, DS1817 supports Link Aggregation and failover functions for maximum performance and service continuity. Mfr Part #: DS1817. An optional two-year extended warranty is available in select regions for up to five years of coverage. Synology DS211j 2-bay DiskStation. Synology DS211J Specs. Was running 2x 6TB WD Enterprise RE drives, per Synology Hardware Compatibility List, this NAS can use most of the recent HDDs up to 12TB in capacity each. Manufacturer Part Number DS416SLIM. Product Model DS416SLIM. Product Line DiskStation. Manufacturer Synology, Inc. Product Type NAS Storage System. Manufacturers change colors and item details frequently and often do not update pictures. Mfr Part #: DS218. DS218 supports 10-bit 4K H.265 online transcoding. DiskStation DS218 SAN/NAS Storage System. Learn more. You can protect your computer and NAS against malicious attacks including the rising encryption-based ransomware threats. Trending at $456.27eBay determines this price through a machine learned model of the product's sale prices within the last 90 days. With a powerful built-in AES-NI hardware encryption engine, DS918 provides exceptional encrypted file transmission. Scalable up to 9 drives with a Synology Expansion Unit DX517, DS918 answers the need for flexible storage capacity. Centralized backup storage for your computersBack up any devices, whether it is a Windows computer, Mac, or other devices. Synology's comprehensive multi-version backup solution can protect your PC and NAS against malicious attacks including the rising encryption-based ransomware threats. Synology DiskStation DS2415 features an all-new quad core CPU with an AES-NI hardware encryption engine, providing outstanding performance and data encryption acceleration. Synology DS2415 12-Bay Diskless Network Attached Storage NAS. Synology DS414 NAS enclosurewith drives. I was always able to keep the fan set to "quiet mode", which is basically silent. For all the details on the DS414, you can find the spec sheet here.